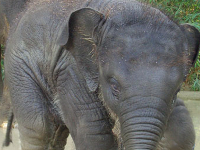 Following a hard-fought campaign in the media by Animal Defenders International (ADI), the Oregon Zoo has finally voided the ownership agreement of baby elephant Lily, and purchased her and her father, Tusko, for $400,000, from owners Have Trunk Will Travel (HTWT), where ADI filmed elephants being beaten and electric shocked with stun guns. This ends the original breeding loan agreement and ensures any future calves belong to the zoo. Baby elephant Lily was born at the Oregon Zoo on November 30, 2012 as part of a 2005 breeding contract between the zoo and Have Trunk Will Travel, owners of the father, Tusko. The contract gave ownership of the second, fourth and sixth offspring of zoo-owned mother Rose-Tu and Tusko. One of these offspring is Lily. Animal Defenders was immediately concerned, wrote to Oregon Zoo Director Kim Smith, calling on the zoo to rescind this agreement, and released undercover footage exposing Have Trunk Will Travel’s abusive elephant training practices. Help ADI continue our work to protect animals worldwide.